An influential committee wants the elections two weeks earlier, giving more time for European Commission elections. Next year's local and European elections are set to be brought forward by two weeks. AN INFLUENTIAL COMMITTEE of MEPs has called for next year’s European elections to be brought forward – a decision which will also require Ireland’s local authorities to hold their elections earlier than expected. The European Parliament’s committee on constitutional affairs has backed a report which would move the elections forward by two weeks, from early June to late May. The current rules require the elections to be held in each EU member state between June 5 and 8 next year. MEPs now want to bring them forward by two weeks, requiring polling to be held between May 22 and 25. The report – which was approved by a significant majority of MEPs at the committee yesterday – now goes before a plenary session of the European Parliament for its approval, and then sent to the European Council for final ratification. Under existing EU rules from 1976, any change to the dates for European elections must be confirmed a year before their due date – giving leaders only a few weeks to confirm the changes. The change will have unintended consequence for Ireland, however, where current law requires local councils to be elected on the same date as the parliament. While this is not a legal challenge, as the date for the elections can be changed unilaterally by the Minister for the Environment, it adds more pressure to local authorities who are tasked with absorbing the roles of town councils before next summer’s polls. This is further exacerbated in the case of the county councils in North and South Tipperary – which are to merge at the next election – and for the city and county councils in Waterford and Limerick which are to be amalgamated at the same time. The changes also cut the time available for a new Constituency Commission, which will have to consider the reconstruction of Ireland’s European constituencies now that Ireland’s representation in the parliament is being cut from 12 seats to 11. The idea for the change is to give MEPs extra time to elect a new European Commission – relieving the current rush where members are required to approve the appointment of a new Commission within weeks of their own election. Most of the major European political parties are planning a new style of campaigning for next year’s European elections, where parties will seek votes based not only on their MEP candidates but also on their prospective candidate to be President of the European Commission. For example, if the system had been in place in 2009, Fine Gael would have canvassed for votes not only on the basis of its candidates for the Parliament, but also for their support for the European People’s Party (EPP)’s nominee for the European Commission: Jose Manuel Barroso. Barroso is tipped to be a candidate for the EPP nomination again next year, seeking a third term, though other possible candidates include Polish prime minister Donald Tusk or the veteran Luxembourger commissioner Viviane Reding. Labour’s European party, the Party of European Socialists, is likely to put forward Martin Schulz, the German who is currently the president of the European Parliament, but former Swedish commissioner Margot Wallstrom and former Spanish premier José Luis Zapatero have also been suggested. Fianna Fáil’s grouping, the Alliance of Liberals and Democrats in Europe, had planned to nominate former Belgian premier Guy Herhofstadt. It is not clear whether the liberals will put forward a candidate, however, as it expects another of its members – NATO secretary-general Anders Fogh-Rasmussen – to replace Herman van Rompuy at the European Council, and the party’s European strength is not enough to guarantee it two of the union’s top jobs. Because it is unlikely that any ‘Europarty’ will get a majority of the parliament’s 750 seats, however, it is likely that the two biggest groups – Fine Gael’s EPP and Labour’s PES – will need some extra time to reach a power-sharing arrangement. 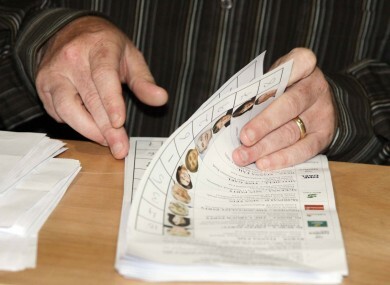 Analysis: How will constituencies change now that Ireland’s losing an MEP? Email “MEPs ask for next year's local and European elections to be moved”. Feedback on “MEPs ask for next year's local and European elections to be moved”.